After watching Zoe's video on her favourite lipsticks I thought I'd give my mine a bit more attention as I usually just use lip balm or lip gloss during the day. I've been wearing this lipstick from Estee Lauder a lot this week and I love it. I bought it from Holly's blog sale months and months ago but never really used it until now. I love the gold but the packaging itself is a bit annoying. When the lid is on, the lipstick can still be twisted up which can squish the product. And yes, I have ruined quite a few lipsticks by this, not sure how it actually happens but it does. Looking on the Boots website it looks like they've changed the packaging so I don't know if this still can happen. I also couldn't find this shade so I'm thinking it could have been discontinued which is a shame. 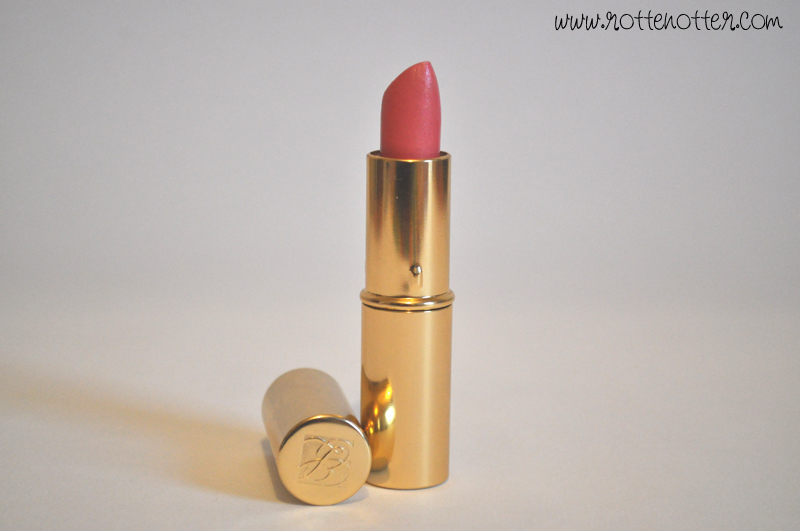 This lipstick itself smells amazing! It reminds me of calpol which makes it even nicer to put on. Pink champagne is a gorgeous bright pink that can be worn very sheer or built up. It's also has a really glossy finish which I love. In the bullet it looks like it's going to be very glittery and gritty but you actually can't see/feel it no the lips.